3Department of Agro-Environmetal Sciences, Faculty of Agriculture, Kyushu University, Fukuoka, Japan. Received 11 August 2011; revised 10 October 2011; accepted 27 October 2011.
environment including soil, water and nutrients. tion techniques have been studied and applied. conducted for growing rice in pot experiment i.e. compare to the shallow water depth treatment. grain yields under the treatment. starting from transplanting until nearly harvesting (e.g. yields a low of rice or low water productivity (e.g. ). tion (SDC) as the following. have been reported in number of countries [6,10-12]. dures. Despite of the skeptics present of SRI, Horie et al. occurs when the water level goes beyond the limit (e.g. needed to encourage farmer for applying the AWD . that paddy fields is intermittently submerged and dried. and then allowed to dry naturally up to 70% SMC. the lower limit and the upper limit is set up to 30 mm . the four provinces in China . using pots with 15.6 cm diameter and 20 cm height. Each pot weight is measured using an available scale. Daiki tensiometer (DIK-3162 pressure gauge type). Rice variety used for the experiment was Nipponbare. of SII that has getting much attention is SRI practice. 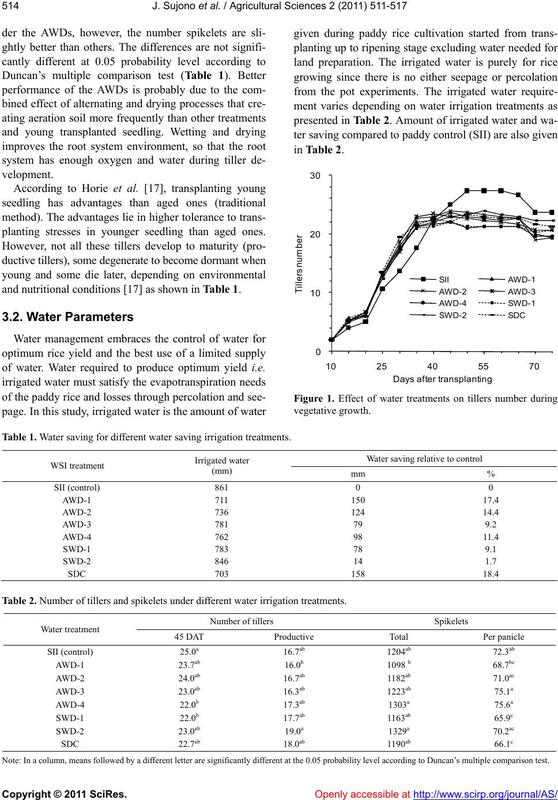 and the resulted grain affect to the water productivity. study. Each treatment consists of three pot replicates. normally applied in paddy rice cultivation is the SRI. the drying begins at the late stage of tillering (40 DAT). tillering stage. The maximum water depth is 20 mm. depth begins at the middle (20 DAT) stage of tillering. planting stresses in younger seedling than aged ones. and nutritional conditions  as shown in Table 1.
of water. Water required to produce optimum yield i.e. Table 1. Water saving for different water saving irrigation treatments. Table 2. Number of tillers and spikelets under different water irrigation treatments. Note: In a column, means followed by a different letter are significantly different at the 0.05 probability level according to Duncan’s multiple comparison test. and most of the time the soil is below saturated condition. as shown in Table 3.
up to 14% compare to the SII treatment. mal planting methods with ordinary water management. normal condition i.e. less than 20%. accesbility, water productivity and practicality. Table 3. 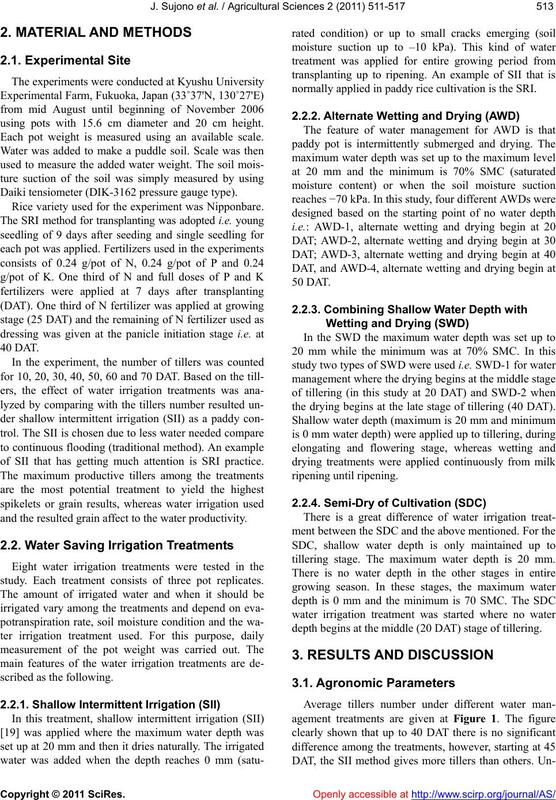 Yield and water productivity for different water irrigation treatments. moist condition rather than flooded (e.g. ). to use than aerobic rice systems like the SDC (e.g. ). significantly than the normal method (e.g. [9,22]). the water irrigated used and increasing the grain yield. der SDC treatment was less than the SII. 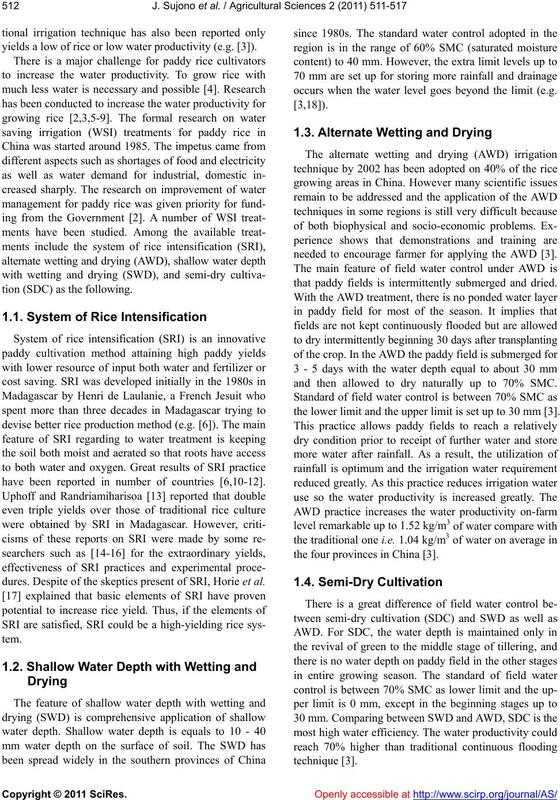 mentally sustainable irrigated rice production in China. 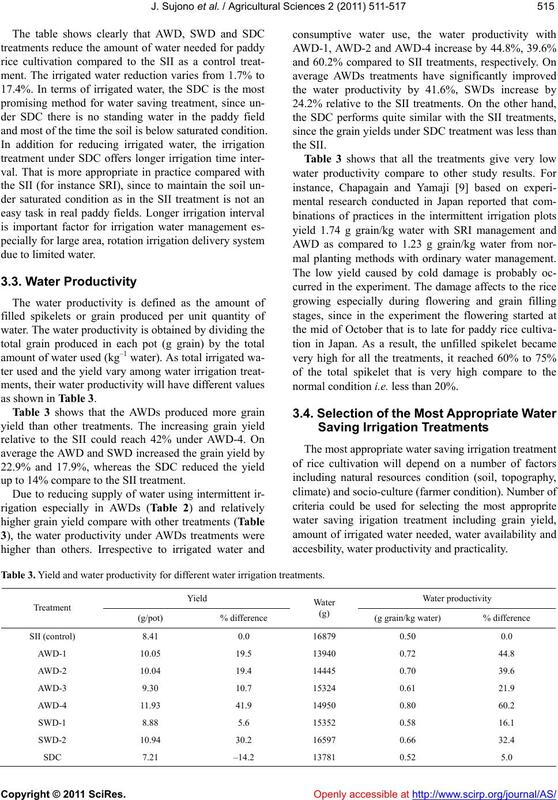 Rijsberman, F. (2004) Growing more rice with less water. 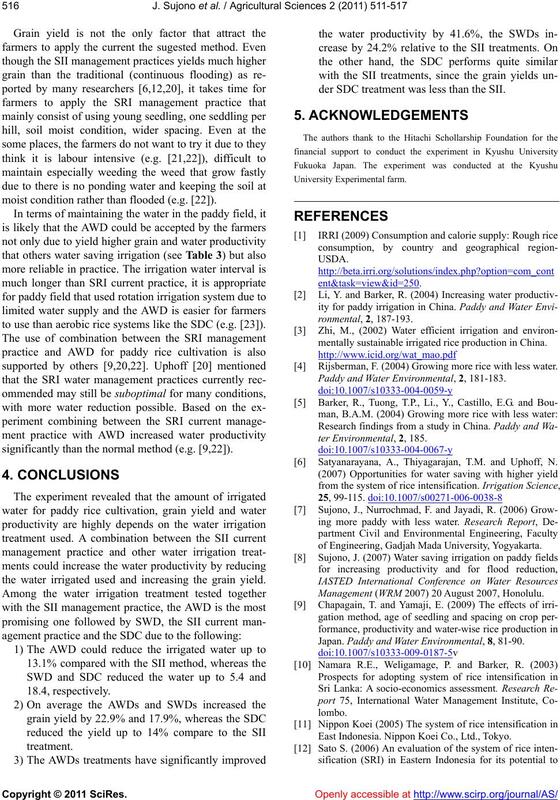 Paddy and Water Environmental, 2, 181-183. Satyanarayana, A., Thiyagarajan, T.M. and Uphoff, N.
of Engineering, Gadjah Mada University, Yogyakarta. Management (WRM 2007) 20 August 2007, Honolulu. Japan. Paddy and Water Environmental, 8, 81-90. East Indonesia. Nippon Koei Co., Ltd., Tokyo. save water while increasing productivity and profitability. IRRI, Los Banos, 7-8 March 2006. Ferrer, A., Yang, J., Zou, Y., Zhong, X. and Huang, J.
tion: Fact or fallacy? Field Crops Research, 88, 1-8. UFOs? 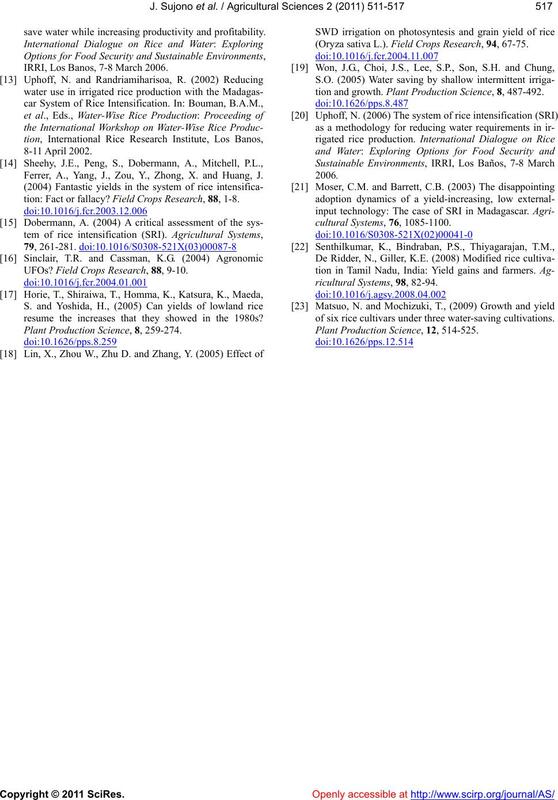 Field Crops Research, 88, 9-10.
resume the increases that they showed in the 1980s? Plant Production Science, 8, 259-274. (Oryza sativa L.). Field Crops Research, 94, 67-75.
tion and growth. 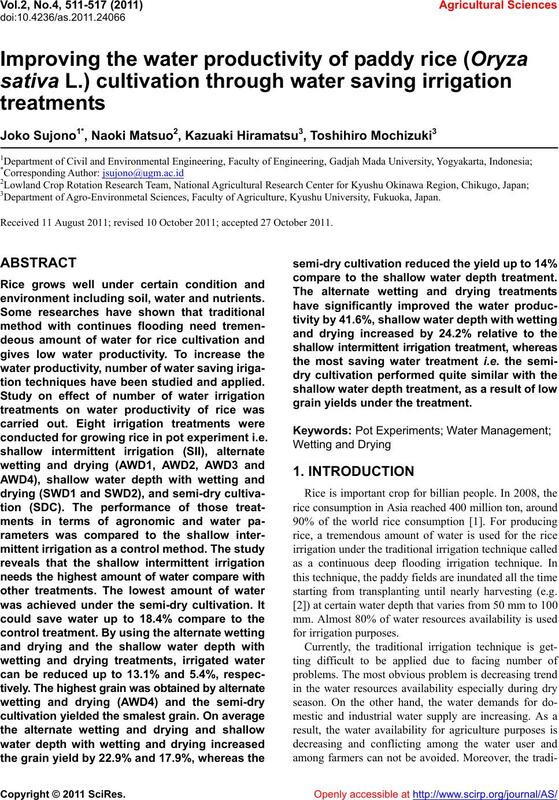 Plant Production Science, 8, 487-492.
of six rice cultivars under three water-saving cultivations. Plant Production Science, 12, 514-525.